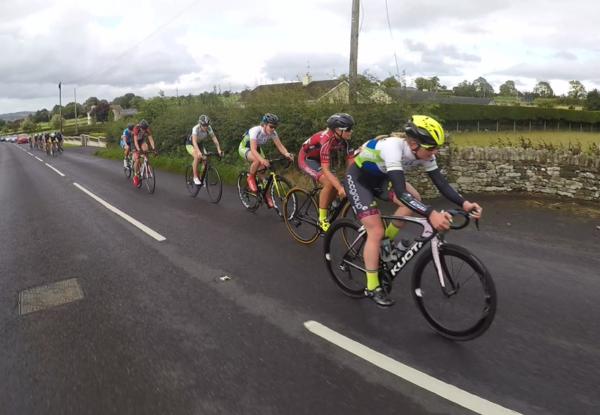 Alice Sharpe leads the group on the way to Omagh Three Day stage victory and the first leader’s jersey of the four-stage race. The Omagh Three Day women’s race stage 1 was won by Alice Sharpe of Phoenix CC. She claimed victory from a breakaway trio. It also contained her team mate Claire McIlwaine and Katharine Smyth (Team Madigan). Orwell Scott’s Orla Walsh was just 9 seconds back in 4th place. However, after her came a gap of 2:12. Sinnead Oakes (De Ronde Van Cork) led home a 15-rider group for 5th place. The time gaps mean that though there is a TT stage and two road stages remaining, the race for the final yellow jersey looks to be between the top four.